The final Cluster Meeting takes place on Thursday 11th October in St Luke’s High School at 7pm. As we approach the final round of Cluster meetings, I would like you as a parish, to consider how we move from a Church of maintenance to mission, and the processes we need for clergy and laity to participate in synodal decision making together. I would also like you to make any proposals to me that will help us implement these concrete plans; these proposals may include closing or merging parishes, opening new parishes, clergy sharing parishes with each other, and the sequencing of Mass times. 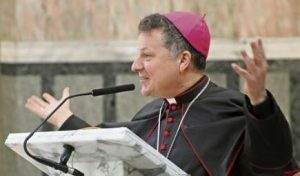 Remember, I do not have any hidden plans already – all plans and proposals that you make to me I will study and examine in line with the principles of our recent Synod; if, after reflection, some proposals are insufficient, we will consider them again. If the plans include an overlap of Cluster areas, that’s fine – I have no pre-prepared plans of my own. This is no easy task, but as we seek to nurture the new wine of your plans, and create the new skins required to contain and implement them, I am confident that the faith and enthusiasm we need will bring to fulfilment your plan for renewal.